Here is a lip-smacking & healthy Indo-Chinese variety! Normally, restaurants use to deep fry the mushroom and add in the sauce. I skipped the deep frying part in this. Try this; you will like! Clean and cut the mushrooms; Keep aside. Heat oil in a pan; add finely chopped ginger and garlic. Saute for a minute. Add capsicum, onion, green chillies and saute those till onion become translucent. Then add mushroom and cook till it leaves water and shrink in size. 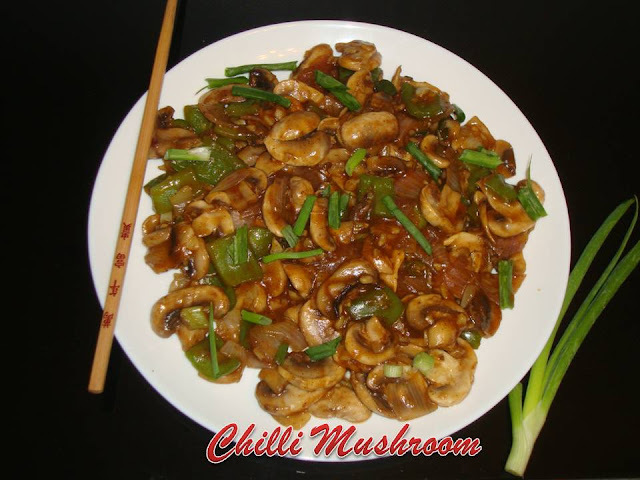 Once the mushroom is cooked, start adding soya sauce, chilli sauce, tomato sauce, salt and pepper powder. Mix 1 tablespoon of cornflour in 1½ - 2 cups of water or vegetable stock without lumps and add to the sauces. Bring the mixture to boil. Once it starts to thicken; give it a mix and garnish with spring onions. You may increase or decrease the sauces, pepper powder and salt amount to suit your taste. Soya sauce already has salt in it, so be cautious while adding salt. I am seding this recipe to Priyasvirundhu and Gayathri'sCook'sspot blog for the event "Walk Through Memory Lane". i love mushroom...I'll try your version.. Very tempting and it looks perfect. I like the fact that, the work gets over with adding couple of sauces. This is a great combination with fried rice or plain rice. so tangy and so lip smacking.. Thanks for linking it to my event!! Looking for more yummy recipes! !